a chemical element, atomic number 19, atomic weight 39.102. (See Appendix 6.) In combination with other minerals in the body, potassium forms alkaline salts that are important in body processes and play an essential role in maintenance of the acid-base and water balance in the body. All body cells, especially muscle tissue, require a high content of potassium. A proper balance between sodium, calcium, and potassium in the blood plasma is necessary for proper cardiac function. Since most foods contain a good supply of potassium, potassium deficiency (hypokalemia) is unlikely to be caused by an unbalanced diet. Possible causes include cushing's syndrome (due to an adrenal gland disorder) and fanconi's syndrome (the result of a congenital kidney defect). The cause could also be an excessive dose of cortisone, prolonged vomiting or diarrhea, or thiazide diuretics, which are administered for treatment of hypertension. Signs of potassium deficiency can include weakness and lethargy, rapid pulse, nausea, diarrhea, and tingling sensations. If the body absorbs enough potassium but the element is not distributed properly, various disorders may develop. Thus an abnormally low content of potassium in the blood may result in an intermittent temporary paralysis of the muscles, known as familial periodic paralysis. Potassium deficiency can be treated by administration of potassium supplements. There is a large variety of these preparations. Some are liquids, some are powders to be dissolved in liquids, and some are slow-release tablets that dissolve in the intestine. All can cause gastrointestinal irritation. For many persons on diuretic therapy for hypertension, potassium deficiency can be avoided by increasing their consumption of potassium-containing foods, such as bananas, dates, prunes, and raisins, and potassium supplements are not needed. Potassium supplements are never given to patients receiving potassium-sparing diuretics such as amiloride, spironolactone, or triamterene. If the difficulty lies in the body's use of potassium, treatment is concerned with the primary cause of the deficiency. Homeostatic balance of potassium. 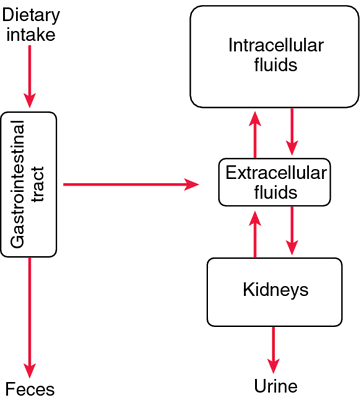 Through the functions of resorption and excretion, the kidneys are the best regulator of potassium balance in the extracellular fluids. From Malarkey and McMorrow, 2000.
potassium acetate an electrolyte replenisher and systemic and urinary alkalizer. potassium bicarbonate an electrolyte replenisher, antacid, and urinary alkalizer. potassium bitartrate a compound administered rectally as a suppository with sodium bicarbonate to produce carbon dioxide, which promotes defecation by distending the rectal ampulla; administered for relief of constipation, and evacuation of the colon before surgical or diagnostic procedures or childbirth. potassium chloride a compound used orally or intravenously as an electrolyte replenisher. potassium citrate a systemic and urinary alkalizer, electrolyte replenisher, and diuretic. dibasic potassium phosphate the dipotassium salt, K2HPO4; used alone or in combination with other phosphate compounds as an electrolyte replenisher. potassium gluconate an electrolyte replenisher used in the prophylaxis and treatment of hypokalemia. potassium iodide an expectorant, antithyroid agent, and antifungal. monobasic potassium phosphate the monopotassium salt, KH2PO4; used as a buffering agent in pharmaceutical preparations and, alone or in combination with other phosphate compounds, as an electrolyte replenisher and urinary acidifier and for prevention of kidney stones. potassium permanganate a topical antiinfective and oxidizing agent, and an antidote for many poisons. potassium phosphate a compound combining potassium and phosphoric acid, usually dibasic potassium phosphate. potassium sodium tartrate a compound used as a saline cathartic. Maintains acid-base balance, isotonicity, and electrophysiologic balance throughout body tissues; crucial to nerve impulse transmission and contraction of cardiac, skeletal, and smooth muscle. Also essential for normal renal function and carbohydrate metabolism. Adults: Dosage highly individualized. Usual single dosage is 20 mEq/day P.O. in divided doses. Adults: Dosage highly individualized. 40 to 100 mEq/day P.O. in divided doses, not to exceed 20 mEq in a single dose. For serum potassium level above 2.5 mEq/L, 40 mEq/L as additive to I.V. infusion at a maximum rate of 10 mEq/hour; maximum daily dosage is 200 mEq. For serum potassium level less than 2 mEq/L, 80 mEq/L as additive to I.V. infusion at a maximum rate of 40 mEq/hour (with cardiac monitoring); maximum daily dosage is 400 mEq. Children: Dosage highly individualized; give up to 3 mEq/kg or 40 mEq/m2/day as additive to I.V. infusion. ☞ Know that I.V. potassium chloride is a high-alert drug. ☞ Give I.V. form as additive by infusion only. Never give undiluted or by I.V. push or I.M. route. Use peripheral line and infuse at a maximum rate of 40 mEq/hour (with cardiac monitoring). ☞ Dilute in compatible I.V. solution per manufacturer's instructions. Administer slowly to reduce risk of fatal hyperkalemia. ☞ To ensure that potassium is well mixed in compatible solution, don't add potassium to I.V. bottle in hanging position. ☞ Be aware that maximum infusion rate without cardiac monitoring is 20 mEq/hour. Rates above 20 mEq/hour require cardiac monitoring. • Make sure patient is well-hydrated and urinating before starting therapy. • If patient complains of burning with I.V. administration, decrease flow rate. • Give P.O. form with meals and a full glass of water or juice, to minimize GI upset. • Ensure that patient swallows wax-matrix tablets completely, to avoid serious esophageal problems. • Don't give wax matrix tablets to patients who have swallowing problems or possible esophageal compression. • Be aware that potassium preparations aren't interchangeable. • Know that dosages are expressed in mEq of potassium and that potassium chloride contains 13.4 mEq potassium/g. • Monitor renal function, fluid intake and output, and potassium, creatinine, and blood urea nitrogen levels. • Assess vital signs and ECG. Stay alert for arrhythmias. • Monitor neurologic status. Watch for neurologic complications. • Monitor I.V. site for irritation. ☞ Know that potassium is contra-indicated in patients with severe renal impairment and must be used with extreme caution (if at all) in patients with any degree of renal impairment, because of risk of life-threatening hyperkalemia. • Instruct patient to mix and dissolve powder completely in 3 to 8 oz of water or juice. • Tell patient to swallow extended-release capsules whole without crushing or chewing them. • Instruct patient to take oral form with or just after a meal, with a glass of water or fruit juice. • Tell patient to sip diluted liquid form over 5 to 10 minutes. • Advise patient to report nausea, vomiting, confusion, numbness and tingling, unusual fatigue or weakness, or a heavy feeling in legs. • Tell patient to minimize GI upset by eating frequent, small servings of food and drinking plenty of fluids. • Inform patient that although wax matrix form may appear in stool, drug has already been absorbed. • Advise patient not to use salt substitutes. used to correct potassium deficiency. a white crystalline salt used as a substitute for table salt in the diet of people with cardiovascular disorders, in administration of the potassium ion, and as a constituent of Ringer's solution. indications It is prescribed in the treatment of hypokalemia resulting from a variety of causes and of digitalis intoxication. contraindications Hyperkalemia; concomitant use of spironolactone, amiloride, or triamterene; Addison's disease; renal impairment; or known hypersensitivity to this drug prohibits its use. adverse effects Among the most serious adverse effects are hyperkalemia and, when the drug is given orally, ulceration of the small bowel. A drug used to treat potassium deficiency. The drug is on the WHO official list. A brand name is Kay-Cee-L. Agent used to correct potassium deficiency. a chemical element, atomic number 19, atomic weight 39.102, symbol K. See Table 6. In combination with other minerals, potassium forms alkaline salts that are important in body processes and play an essential role in maintenance of its acid-base and water balance. All body cells, especially muscle tissue, require a high content of potassium. A proper balance between sodium, calcium and potassium in the blood plasma is necessary for proper cardiac function. Alfalfa meal, molasses and soyabean meal are good sources for herbivores. electrolyte replenishers, weak diuretics and urinary alkalinizers. Some are also used as expectorants. used in the treatment of seizures in humans and dogs. used commercially as a fertilizer. a compound used orally or intravenously as an electrolyte replenisher. may be present in industrial effluents. A potent cause of cyanide poisoning. nutritional deficiency of potassium is very rare. In calves can cause poor growth, anemia and diarrhea. Experimental deficiency in piglets causes also incoordination and cardiac insufficiency. an oral preparation administered to limit the amount of potassium available for absorption; used in the management of hyperkalemia. See also ion-exchange resin; sodium polystyrene sulfonate. used commercially as a caustic. In veterinary medicine used mostly for clearing skin scrapings in the diagnosis of ectoparasite infestation. used as a constituent of salt blocks and mixes to supplement the diet with iodine. Overdosing will cause iodism. an expectorant and antithyroid agent. used commercially as a fertilizer and a meat preservative. Can cause nitrate poisoning or nitrite poisoning in ruminants. a compound sometimes used in place of potassium nitrate. Overdosing causes methemoglobin formation and severe, sometimes fatal hypoxia. causes poor growth, anemia and diarrhea in pigs and calves. Electrocardiographic changes are also recorded. See also hypokalemia. a topical anti-infective, oxidizing agent, and antidote for many poisons. See also permanganate. a compound used as a saline cathartic and also in combination with sodium bicarbonate and tartaric acid (Seidlitz powders, a cathartic).